Preheat oven to 350. Beat cream cheese, sugar, zest, juice, and vanilla on medium until well blended. Add eggs, mix just until blended. Pour into crust. Bake 40 minutes or until center is set. Cool. Refrigerate at least 3 hours, or overnight. Optional: Garnish with more lemon zest, or any fruit you have handy. This day it was fresh strawberries from the local farmer’s market. My mother likes to bake. She is a very left-brained person by nature. She is a bookkeeper, a quilter, and when she feels like it, a baker. It drives her crazy when she asks me how I made something for dinner because when it comes to measurements I wing it or eyeball it. Cooking isn’t a science like baking. It is an art. I always say that a recipe is like a blank canvas. It gives you the foundation you need to create your masterpiece. While not many of my recipes I would consider masterpieces, I do enjoy creating them, and I do enjoy eating them, so I’ve at least got that going for me! A couple weeks ago I grabbed a recipe off the internet, Prevention.com to be exact. It was a light and healthy salad I was looking forward to making. Except I kept getting side tracked by friends, and fun, and work. By the time I finally got around to making it, I had received an email with a similar salad recipe from Whole Foods. But it was just different enough that I thought, damn, I could blend these two together and make a REALLY good salad that eats like a hearty meal. It turned out delicious, and even better the next day when the flavors all had a chance to really meld together. And with our recent hot weather it made for a perfect dinner on a warm night. Remember- objects may be closer than they appear in miorror- all measurements are just approximate to be used as a guide. Cook orzo in boiling water according to directions (al dente). While cooking, drain and rinse garbanzo beans and place in large bowl. Add all other ingredients, toss, and let set for 10 minutes. 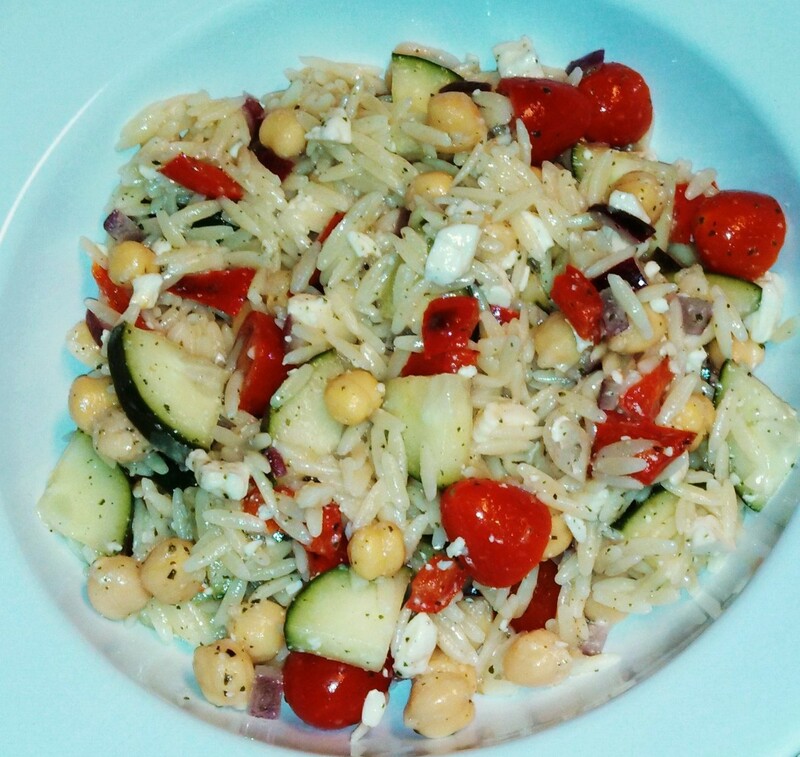 Drain and rinse orzo in cold water, twice. Drain and add to bowl. Toss together and serve! Note: If you are gluten-free, omit the pasta. If you are going dairy free or vegan, omit the feta. 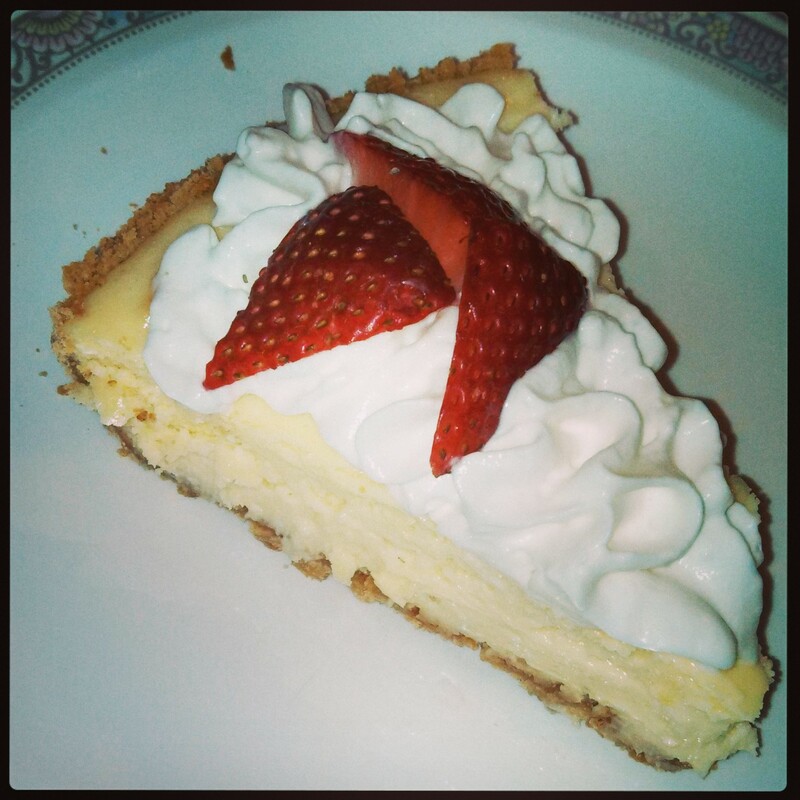 This is such a yummy recipe in many forms, find one that is best fit for you! Every time I receive my new “goodie box” from Raley’s Something Extra Try-It program, I get giddy with excitement! The newest one takes the cake, literally! As soon as I saw the cute Easter Bunny cupcake papers, I knew I needed to hold of until Easter to make try these cupcakes! 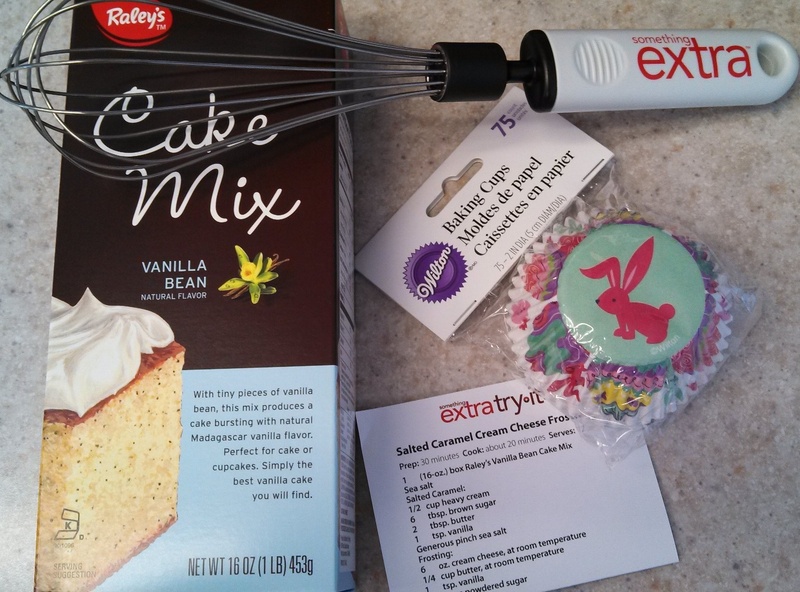 I was very impressed with the richness of the boxed cake mix. It tasted like it was from scratch. The frosting recipe was decedent and had a perfect balance of sweet and salty. I served them at a party and brought them to Easter dinner, and had nooooo complaints. To prepare caramel, bring cream, brown sugar and butter to a boil in a small saucepan. Reduce heat and keep at a low boil for 10 minutes, stirring occasionally. Stir in vanilla and salt and transfer to a small bowl; cover and chill. To prepare frosting, beat cream cheese, butter, vanilla and 3/4 of the caramel together until light and fluffy. Slowly beat in powdered sugar until smooth. 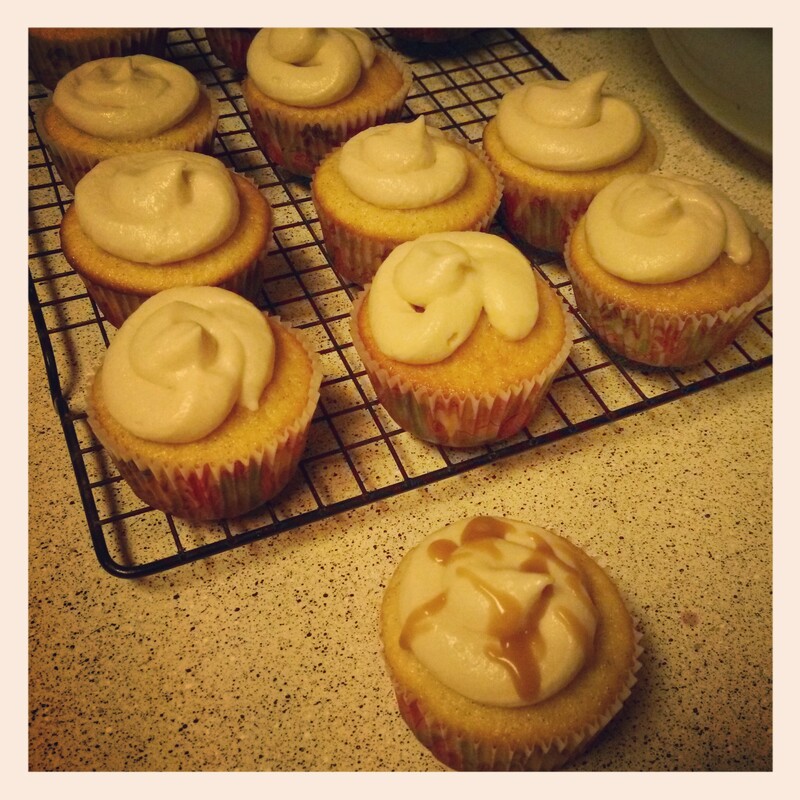 Spread over cupcakes and drizzle with remaining caramel, warming for a few seconds in the microwave if too thick. Add a small sprinkle of sea salt to each cupcake. As part of my goal for 2013, I am trying a new recipe every week. Here is where I will post my weekly recipe and hotlink to the actual recipes when I get them posted! I’m not much a sweets fan, but in the midst of doing my Christmas baking, I decided to attempt a quick add to all my cookies. And by quick, I mean QUICK! I threw a box of boring old chocolate brownie mix in the mixer, made it per the directions on the box, and threw it in the oven. While it was baking, I crushed up a bunch of mini candy canes, and with about 2 minutes left in the oven, sprinkled them on top. Tada! 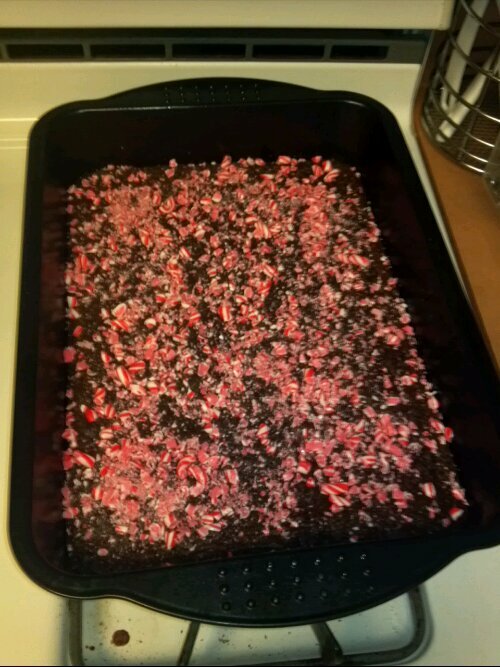 Pretty pepperminty chocolate brownies were born. Easy peasy! Where do you find your sparkle? Where do you find your soul? A movement towards balance and self-discovery.